"Thousands of families lost their homes in the fires that devastated Sonoma County. For hundreds of them, no federal help is coming. An estimated 38,500 undocumented immigrants live in Sonoma County. Unlike other victims of the fires that have devastated Sonoma County, undocumented immigrants do not qualify for assistance from the Federal Emergency Management Agency (FEMA).Even when they do qualify for services, many are unlikely to pursue those benefits due to fear of immigration enforcement, lack of familiarity with official institutions, and limited English proficiency. At every turn, our undocumented neighbors face barriers and challenges to recovering from the fires. 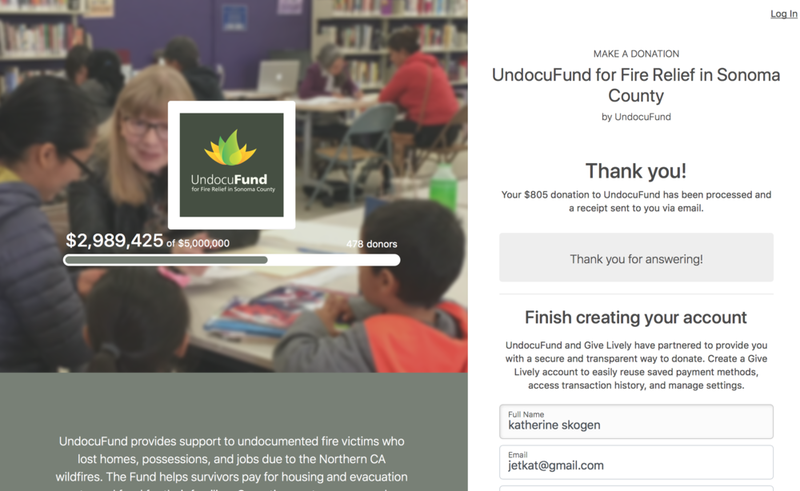 The UndocuFund exists to support them in rebuilding their lives in Sonoma County." Thank you to all of my amazing families who made this possible. Wishing you love in 2018, Kate Skogen. Our son turns 8 today, which has also been dubbed #givingtuesday. I thought I’d share how he contributes to local charitable organizations. We started giving our son allowance when he was 4. We want him to practice saving and spending money, as well as making mistakes with money, while he's young. His allowance is divided into 3 jars: 1/2 to spend, 1/4 for long-term savings, and 1/4 goes into the donate jar. The allowance we give is not in exchange for chores. Chores are family jobs to keep the house in order and (generally) clean. Everyone pitches in because I can’t do it all myself (and obviously, I don’t think I should). I told him all along that he could choose how he wanted to donate the money. At this point, he’d rather keep the money for himself for legos and whatnot, but we’re doing our best to encourage our son to grow up with a healthy sense of compassion and a strong charitable spirit. We try to set a good example by donating our time and money to organizations. Over the summer I read a great book by Ron Lieber called The Opposite of Spoiled: Raising Kids Who Are Grounded, Generous, and Smart About Money. It gave me the kick in the pants that I needed to sit down and research local organizations. There are so many good organizations out there, but with the info from Charity Navigator, I narrowed the list to 7 choices for him to choose from. In no particular order, the organizations on our list are Edible Schoolyard Project, Reading Partners, Homeless Prenatal Program, Second Harvest Food Bank, Eastside College Preparatory School, Child Advocates of Silicon Valley. Now that the kids are getting older, it’s easier to find opportunities for us to volunteer as a family. We feel it’s important to donate our time as well as money. I've attached the spreadsheet I made in case you want to peek. Our son glanced at it for all of 5 seconds after I explained how to read a spreadsheet and said, "that one; it's in San Jose and got a 100%." Sheesh… baby steps, y’all. How do you give back to your community? What are your thoughts on children donating money? Let me know in the comments.